Fresh homemade guacamole takes less than 10 minutes to make! Avocados are a good source of Vitamins C and B6 as well as dietary fiber and monounsaturated fat (the good fat!). It'll feel like an indulgence, but trust us, it's good for you! 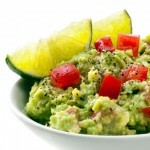 Combine avocados and lime juice in a medium sized bowl and mix until avocado is smooth. Add tomatoes, onion, garlic, and cilantro and stir.